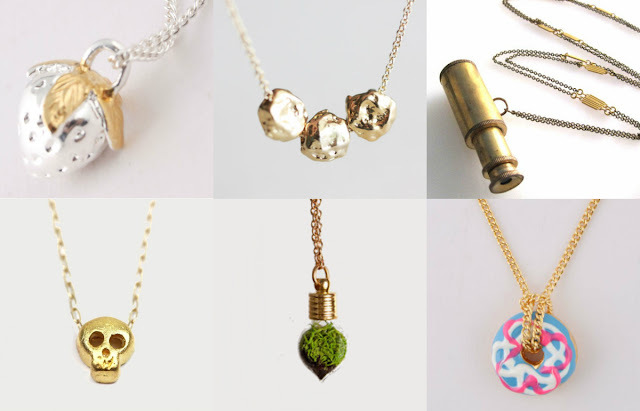 I really love quirky pieces of jewellery. I think it's such a nice way of making a simple outfit that wee bit more interesting and eye-catching. As it's a cold, boring Monday morning (I am presuming. You might be having a wonderful Monday, in which case - carry on and have fun!) I thought I'd cheer us all up by putting together a wishlist of pretty things. Here's a few of my favourite pendant necklaces. I didn't intentionally only pick gold or brass items, but ever since I was given the skull necklace (last Christmas, thank you wonderful Craig!) I fell in love with gold jewellery. They're priced from £20 - £115 so you can treat yourself, or share this post and hint to someone before Christmas! The strawberry necklace is completely precious :) I love the skull necklace as well. I was searching gift to my girl, I will buy first heart one or the last donuts one to her. I’m quite sure she will surprise. With the designer handbags, you can change your looks and personality altogether and that too everyday. Get your wardrobe full of shopping that imparts you a great look and change your appearance. Designer handbags can provide you an appearance like none other. Every season has a unique changing trend and the specialty of designer handbags is that they come out with something special every time, every season. These look hot with every dress of yours and are also a great way to accessorize you. Designer handbags add a little extra glam angle to your wardrobe. Designer handbags use colors which are extremely bold and assiduously match all your dresses and shoes. These bags allow you to be a center of attraction. The exotic shades, colors, design and skin materials look absolutely exquisite and appealing to the eyes. The popularity of designer handbags has increased manifold and infact they have been crafted to be made desirable by all the women. Designer hermes handbags online can be the most enviable product for the women.